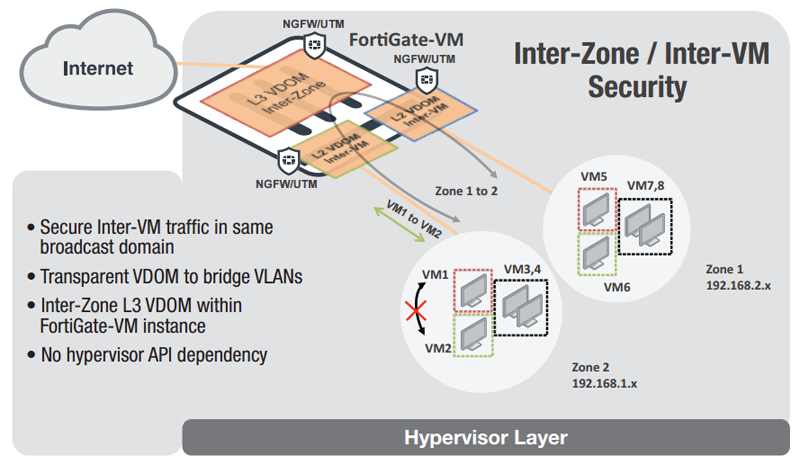 FortiGate virtual appliances allow you to mitigate blind spots by implementing critical security controls within your virtual infrastructure. They also allow you to rapidly provision security infrastructure whenever and wherever it is needed. Moreover, FortiGate virtual appliances feature all of the security and networking services common to traditional hardware-dbased FortiGate appliances. With the addition of virtual appliances from Fortinet, you can deploy a mix of hardware and virtual appliances, operating together and managed from a common centralized management platform. The delivery of both physical and virtual planes security appliances it offers on one side, and the unmatched performance and security capabilities it provides on the other side, allow the growth and evolution of the consolidating Data Center with no service degradation or bottlenecks, no compromise on security, and with an unmatched ROI — fulfilling the outcomes of a robust softwaredefined security framework. Fortinet’s comprehensive security virtual appliance lineup supports in excess of 16 solutions. Few organizations use 100% hardware or 100% virtual IT infrastructure today, creating a need for both hardware appliances and virtual appliances in your security strategy. Fortinet allows you to build the security solution that’s right for your environment with hardware and virtual appliances to secure the core, the edge and increase visibility and control over communications within the virtualized infrastructure. 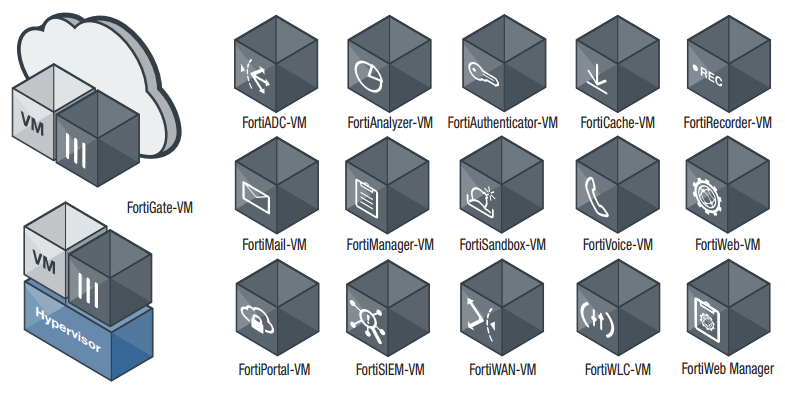 FortiManager virtual or physical appliances allow you to easily manage and update your Fortinet security assets — hardware, virtual or both — from a single pane of glass. Using the advanced FortiOS operating system, FortiGate appliances effectively neutralize a wide range of security threats facing your virtualized environment. Whether deployed at the edge as a front-line defense, or deep within the virtual infrastructure for inter-zone security, FortiGate appliances protect your infrastructure with some of the most effective security available today by enabling security features you need. All Inter-VM traffic in Bravo Zones are subject to full UTM scan through L2 VDOM. Inter-Zone traffic subject to full Next Gen Firewall and UTM scan by L3 VDOM. 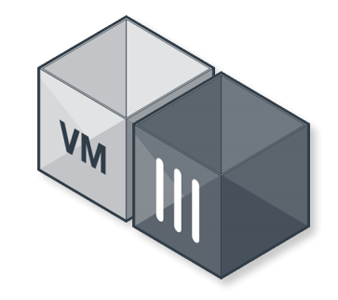 Alpha Zone VMs can all talk to each other freely. 2. 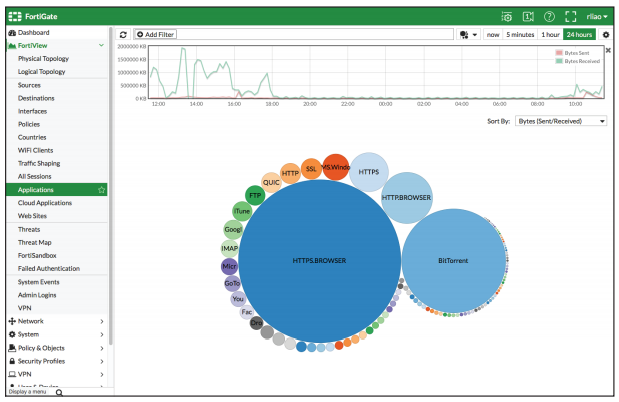 Application Control performance is measured with 64 Kbytes HTTP traffic. 3. NGFW performance is measured with IPS and Application Control enabled, based on Enterprise Traffic Mix. 4. Threat Protection performance is measured with IPS and Application Control and Malware protection enabled, based on Enterprise Traffic Mix.